I’ve said it before and I’ll say it again, there’s nothing like having a prototype to evaluate (The Value of Physical Prototypes & Moldflow and Part Visualization). This is mostly due to the fact that simulations that represent real-world performance are timely and costly to develop. I can’t remember an instance when I relied on FEA alone without empirical testing to establish actual performance of the simulation. Autodesk is getting closer to bridging this gap between simulation and the real world by integrating key features of its large software portfolio. The first thing they did that impressed me was their integration of Moldflow and Showcase to aid in the visualization of cosmetic defects on plastic parts (re-link: Moldflow and Part Visualization). 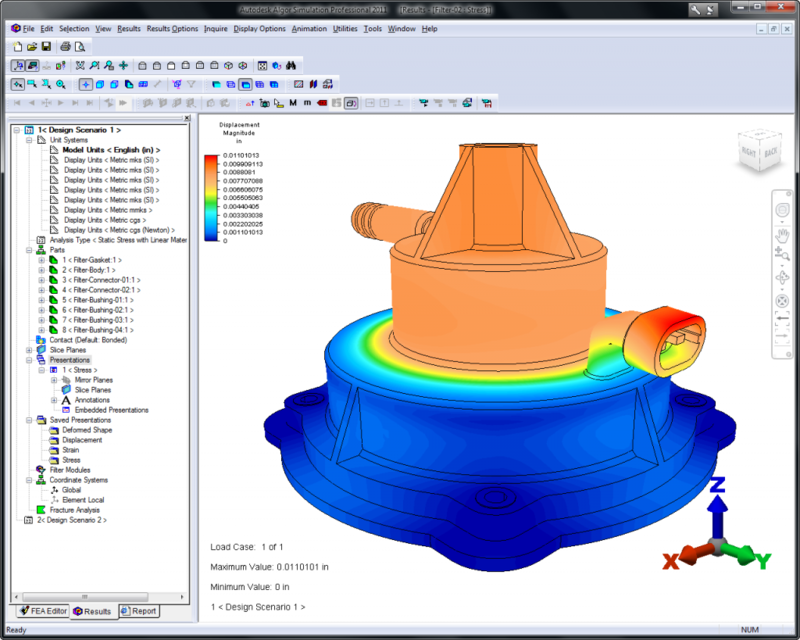 Even more interesting and, in my opinion, useful, is their interoperability between Moldflow and Algor (FEA/mechanical simulation) which addresses the issue of simulated material properties vs. real-world material properties. Typically material properties are applied to FEA models with the assumption they are isotropic. But most injection molded plastics are anisotropic. The real material properties of injection molded plastic parts are dependent on many factors. Flow of material through the mold is an important one since it is the material flow that determines fiber and molecular orientation. This is especially important in the case of glass-filled resins; the strength in the direction of the glass fibers is greater than in the transverse direction. 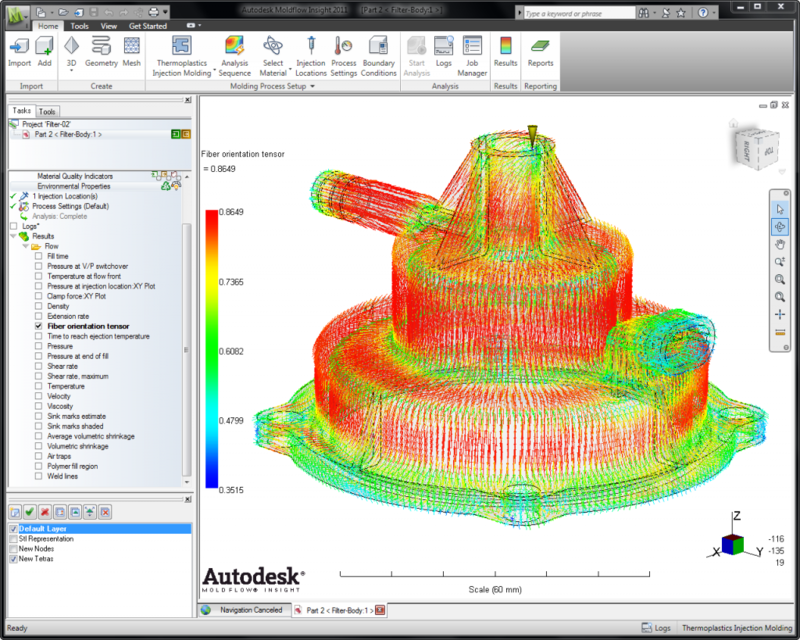 The magic bit of the Autodesk offering is that Moldflow results can be imported into Algor where they are used to calculate material properties at each point in the FEA mesh, better representing the plastic part coming out of the mold. Different gate locations and process parameters can be simulated through both Moldflow and Algor to determine how to maximize the performance of the part in critical areas. It’s not going to eliminate the need for empirical testing of final parts but it definitely helps in optimizing designs early in the process.